It was twenty years ago today… has mass protest gone the way of HoJo’s? Happy Coming Out Day. Did you know that this institution began at the Second National March on Washington for Lesbian and Gay Rights on October 11, 1987? I didn’t. Or perhaps I did, and forgot, but Wikipedia just reminded me. Anyhow, this archive episode is about that very march. And for your historical edification, here’s a bonus archival photo of me at the actual live-action, non-cartoon march. I was marching in solidarity with the Gigantic Eyeglasses Contingent. Wait, now I’m getting all nostalgic…I actually marched with the Minnesota contingent because that’s where I was living at the time, and we were singing the Mary Tyler Moore theme song, which seemed suddenly to reveal a profound revolutionary subtext. “Love is all around, no need to waste it…You can have a town, why don’t you take it…” A guy tossed his hat up in the air like Mary does as she runs across the street…wait, did he actually have a tam o’shanter like she wore? Was he in full Mary drag?! Oh, man, this is how the historic record gets corrupted. People’s faulty memories combined with the tendency to embellish things in order to make a better story. All I know is, someone threw something up into the air at right moment in the song, and a spontaneous and transcendent ripple of joy united us all for a moment. It was much more moving than chanting any slogan ever was–chanting always makes me feel foolish, but at the same time I feel guilty about feeling foolish, which is compounded by a feeling of foolishness about feeling guilty about feeling foolish, by which point the possibility of experiencing a sense of solidarity with anyone has long since passed. For those of you complaining about Clarice’s hairstyle, I think it was out of date even in 1987. When I was in grad school, we went on strike — the TAs were trying to unionize (we were being organized by the UAW, of all things). Our game union steward kept trying to come up with rhyming chants for us to do on the picket line, and lemme tell you, you haven’t seen comedy until you’ve seen humanities graduate students at Berkeley squabbling over just what kind of rhyming chant best encapsulates their grievances, being forceful and clear without being reductionist, etc. I felt extremely foolish and not at all solidarity-riffic. Speaking of hair, I like Mo’s classic late-80s mullet… and who’s that in the leather jacket and the flattop, Lois? Thanks so much for the memories and the heads up that today is the 20th anniversary of that march! I went with my newly minted first lesbian love and it was an experience I’ll never forget. There were many spontaneous ripples of joy through that crowd, which had an energy and a level of pure happiness that I will never forget. They just don’t make marches like the ’87 MOW anymore. We were young and it was fun. Wiki’s take on Coming Out day–that can’t be right! I remember it in my first year of college (as something rather quaint, actually), and that was the spring of 1984. Time to update the dopplega:nger list? When I was in college in the mid-eighties, BiGALA came up with something called “Gay Jeans Day.” If you were sympathetic to gay rights you’d wear your jeans on that day. I thought it was ridiculous, since 90% of the students wore jeans every day as a matter of course. If was kind of funny, though, watching the fratboys walking around in shorts in the middle of winter. awww. my girlfriend calls those monitor glasses. i also love how happy the gay cowboys look as they are walking away. Am I the only one to notice the timeliness of Mo’s remark in panel 4? PS For the system administrator: it would be nice to have a preview for comments. Just to check that the links work ok.
Dr. Empirical – were you at Wesleyan? Or was this a widespread phenonmenon extending beyond that particular corner of CT? Re: The Mary Tyler Moore song–“You can have a town”? Really? Is that how it goes? I’ve always thought it was “You can never tell”. Or maybe this is a way funny joke and I am way too literal…it happens sometimes! Also, where have the past twenty yers gone? Alison, you look the same today as then. Are you getting facial peels on the sly? Wonder what we were doing in my second grade class on National Coming Out Day ’87. Deborah- I was at UCONN. Different school, same corner of Connecticut. I don’t have the time to re-write it now. Suffice to say, that gigantic eyeglasses do seem to quintessentially 80s, don’t they? O Ma G*d O Ma G*d O Ma G*d!!! I’ve been saying for years that in a just world, Doris Lessing would be a Nobel prize… and it’s just happened. It’s about time. She’s 88 years old! 10 or 15 years ago, I guess this would have given me a lot more hope than it does now. Now I’m tearing up. Sorry for being off topic… Back to coming-out day. Here’s mine: I totally identify with Al-Ith in Lessing’s book, “The Marriages Between Zones Three, Four and Five” which is part of her amazing “Canopus” cycle of philosophical novels. Oh, and I’m a bisexual, polyamorous Buddhist witch. This in response to jactitation and the “gay jeans day” comments. First, I think Wiki’s take is correct on Coming Out Day. I was in college in the 80’s and I think there were yearly Pride events (at some more progressive schools) but Coming Out Day happened post ’87. We also had “jeans day” in college in the 80’s and the whole point was to get people’s attention by forcing them to decide whether or not they would wear jeans that day. It was a way to raise awareness – that’s why jeans were chosen. Our school later changed it to “wear pink and black to support gay rights” – pink was for the pink triangle and I think black was for those people who hated pink – not sure. Three across in the back seat of a classic Beetle? Can’t be done. I’m not convinced that Gay Jeans Day did increase awareness. I think that the vast majority of people in jeans that day either weren’t aware of the implications or just didn’t care. All it did was provide a rallying point for the anti-gay crowd, who wore their most ostentatiously non-jean clothing on that day. While I certainly sympathised with the goals of the event, I don’t believe they were accomplished. I also resented having a political statement, even one I agreed with, imposed upon something I did every day. I’m a rebel that way. Re: the Mary Tyler Moore theme song– Joan Jett does a killer version of that. and I, uh, have that song on my iPod for reasons I won’t go into here. Chanting at demonstrations is painful. If the goal is to win over onlookers, it’s not working. If the goal is to feel solidarity with those around you, it’s not working then either. I much prefer singing. Something in a range most people can handle, you know? “Step by step” is an excellent choice for a march. Music is emotional. Chanting is more of a military thing, in practice. In reply to “Also Nostalgic”‘s comment, I’d say that if the pink stood for the pink triangle, black could be assumed to stand for the black triangle. Oh, and I’m a cowboy too! The offspring competes in horse shows and rides at least once a week…go cowboys! Well, the ubiquity of jeans was the point. As someone else pointed out: to show that many people are so bigoted that they’ll give up their ordinary favored clothing to avoid being mistaken for decent human beings. It makes the bigots visible, and on your own account it did so very effectively. Perhaps the point wasn’t well publicized. That could be due to straight student media’s incompetence of course. But then, if it were made clear *before* the event, people might be able to dodge it. And afterwards, it would be hard to do follow-up; media don’t like doing things like that. DSW, in panel 9, Mo is looking at the fork in Harriet’s hand. As I remember it, Coming Out Day (Oct. 11th) started one year after the 1987 March on Washington, as a way of marking its anniversary and keeping the energy going. Like Harriet and Mo, the slow hook-up to my first girlfriend began at this March as well. That makes much more sense with the thought bubble! Fashion be damned, but I still see narrow horn-rimmed glasses as nerd glasses. Of course, there are nerds and nerds. Saith Floss Forbes: If you don’t know the tune, sing tenor. It is uncanny how that blond cowboy looks just like Heath Ledger. I think those guys were dressed up in “gay drag” for the march. But maybe I’m just too urban to know anything else. And I think Mo’s eyes are uneasily going back and forth between the fork and the package. Guilty secrets no. 43: I’ve never ever been on a political march. “We shall overcome” always reaches me in a way that chanting never does though. I was 13 when this strip came out. I’d already lost my virginity and watched my first gay film (Maurice of all things), and there was a weird programme about gays on Channel 4 called Out on Tuesday, but I’d no idea that I was a threat to the nuclear family or that there was a “lifestyle” (I hate that word but Roget’s deserting me right now). I only knew about the cottaging/tearoom scene. By the way: on glasses: mahoosive sunglasses that would make Jackie O jealous are in over here – have you seen any pics of Victoria Beckham? (If you haven’t, don’t waste your time looking). Either Jackie O style or ones like Uma Thurman in “Kill Bill”. This in the land that gave you Elton John. We were talking about the show last night! A friend confided that he used to get very sad when the melancholy cat mewed at the end of the show. He used to imagine that the cat was homeless and cold and lost ..
We were all so young then… Thank goodness, we still are ! Yes, the kitten mewing! That meant it was back to life without Mary for another long, bleak week. The two cowboys remind me of a favorite moment from WAY back when. This occured in Providence Rhode Island, during the ERA attempt. A ladyfriend of mine and her friend were holding down the “Support The ERA” table near the State House. I’d been doing food/drink runs, as well as filling in during bathroom breaks. He says good afternoon to the women and to me, signs the petition, stuffs a twenty dollar bill in the donation jar, takes a bumpersticker, walks back to the truck, applies the sticker to the tailgate, gets in the truck, smiles, waves and drives off. Her friend pretty much summed it up. As far as Clarice’s hairstyle: once upon a time, I had a mullet AND a perm, so I should talk. Yeah, it’s Coming Out Day, and it’s also Breast Cancer Awareness Month. One and a half hours ago, I found out I have to have a mastectomy. Probably a double. At the age of 40! My point is, please get your mammograms. I don’t feel very Mary Tyler Moore-ish right now. I used to know one of the Husker Du guys’ sisters. She’s a dyke. Shadocat, a mullet and a perm? How did your head not explode? before DSW’s comment, I’d read Mo’s gaze in the panel w/the headline as being directed at Harriet’s fork. guess I missed that it is also directed in cowboy’s direction. how clever that the strip was drawn (intentionally or not) so Mo seems to be taking in Harriet’s weapon AND its target. and what a delight that someone here noted it! 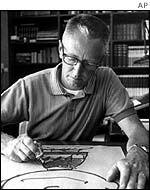 NLC, I’d never thought of Charles Schulz as a babe, but now that you mention it, there is a resemblance to the author of the blog . . .
Everyone else, go do your BSEs. Boys too. Thanks Alison. I burst out laughing when I saw your Husker Du post following mine, because even though I don’t know you, I knew you’d have one of your guilt spasms (a “paroxysm of shame”?) with worrying that you came across as insensitive. You’re sweet, my internet friend. One thing…neither this time, nor the last time, would a BSE have helped me. Of course I don’t mean to discourage them. But only the mammogram was able to spot the spots. This time it’s invasive, but there’s stilll nothing to feel. And, um…how did you know that the Husker Du sister was a dyke? Ginjoint—I too, did not mean to be so callous—it’s just that I’ve been putting off the M-gram for a couple of months now, and your news kinda started me. I’m scheduling tomorrow a.m., and lighting a candle for you tonight. I wish my mom was here. OMG! I remember that strip when it originally came out. 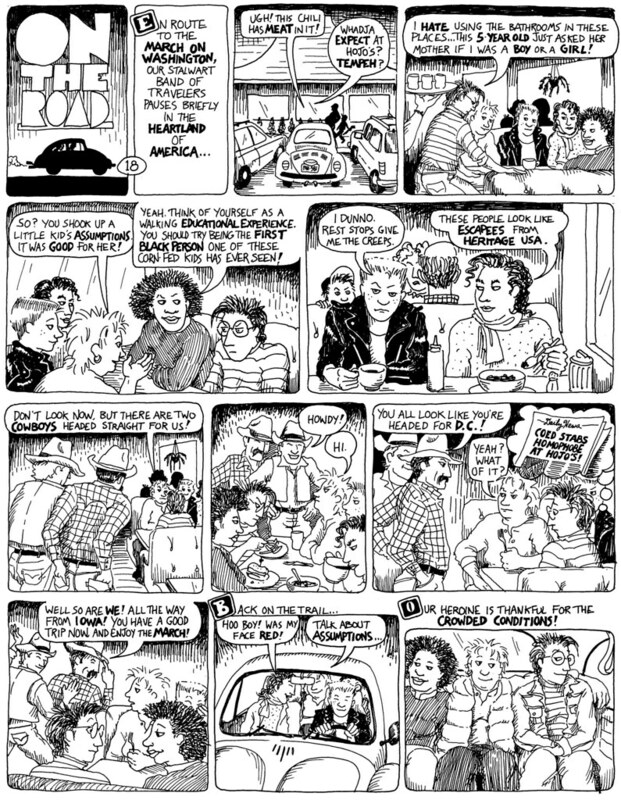 I saw it in OutFront, the Denver GLBT rag back in those days, when I was in grad school. 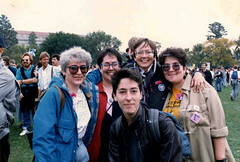 I also flew to DC from Denver for that march, walked with the ActUp people in their early days. And I remember having gay jeans day at a later phase of grad school in Buffalo. It was only effective if the campus was plastered with announcements (and this was a huge campus). I think it worked pretty well once or twice. My God, I’m not alone. I know that feeling all too well. It has, sadly, ruined what should’ve been many elating, important, moving experiences. Christmas, for the most part, and any and all marches or spiritual gatherings of any kind [Yoga, for example]. The moment with the cowboys is a personal favourite of mine in the strip’s history. Dunno why, but I keep re-reading that one strip in my “paperback” [I forget the actual word; collected strips? compilation? compendium?] version. Happy National Coming Out Day to you all! I still have my Keith Haring button …. And I remember that special 1987 March on Washington. Times have changed and they also have not. Ginjoint…Your Aunt Soozie is here if it helps any! And tomorrow I’m gonna call and schedule my mammo too..have been successfully avoiding it for the past four years…I’m long over due. Let me know if you need anything Ginjoint…I just learned that I actually CAN send chicken soup and matzo balls UPS in a cooler with a bunch of blue ice and have it arrive mostly still frozen, but, uhm, that was only a 48 hour journey…still…I’m try for 72. Candles lit, energy flying…please keep us posted. Coincidentally, I made an appointment yesterday for next week. By any chance, did you go to the big protest in Minneapolis when Ronnie was there for the fundraiser (think it was in ’86…) I was in that crowd…and nearly got in lots of trouble for throwing Jellybellies. I still have my Nuclear Freeze button, and my WAMM newsletters. Ian, those shades are “in” here too but let’s just say I’m not wearing ’em…of course, I did wear socks and tevas today so…there you have it. Alison, Lyle Lovett called…he wants his hair back. Just for the record, both Grant Hart and Bob Mould of Husker fame are out gay men. Thanks, youse guys. I laugh! Then I cry! Then I cry, then laugh! Then I play air guitar in my underwear to “Crazy Train”! Tomorrow blood gets drawn for the BRCA 1/BRCA 2! To see if the ovaries should go too! Deena, did you really throw Jellybellies at Raygun? Did you manage to hit him? Yes, I did…and no, I don’t think I was close enough. More’s the pity. Ginjoint, all blessings to you. My little sister had a mastectomy and ovaries out when she was 42. She’s now 53 and blooming and they have had a fabulous life ever since – seem to be off holidaying five times a year on their very ordinary salaries – so horrible though it is, there can be positive outcomes. Because of this family link I could have a mammogram every year but so far have just gone on the regular three-year cycle (we get dragooned in for this in the UK), maybe it’s time to check those dates. I’m determined to outlive M.Thatcher, at whom sadly I never threw a jellybaby. Wow, Ginjoint, your announcement makes arguing over the words to the Mary theme seem sort of… trivial. Best of fortune in the fight against entropy. Also the lead singer of Husker Du, Bob Mould, is gay. Just an FYI. I dunno, I can get into the chanting thing, the problem is keeping up the energy for the whole march. I was at the March on 10/11/87 — can’t believe it was 20 years ago. I was there with my first girlfriend from college. Now she lives upstairs from me with her girlfriend/wife (who is also my best friend) and I live downstairs with MY girlfriend/wife. We even had a double wedding at SF City Hall in ’04! Love the comic(s), love the “don’t make assumptions” story in this one, but seriously. Cowboys? “Howdy”? In Iowa? Think Ashton in his John Deere cap. Get the stereotype right! Feed caps, dear, feed caps. Thanks for the strip, with all its humor, satire, and social commentary. Always a pleasure! KA, the cowboys were at a rest stop just like our gals. They weren’t necessarily from Iowa. Who knows? They could be Texas boys. I have always loved this particular strip. j.b.t., the “cowboys” *said* they were from Iowa. “All the way from Iowa!” It’s a long way to drive in Village People costume, but what the heck. This is one of my favorite moments in DTWOF too. Ginjoint, your spirit is a blessed relief to this woman who can’t remember when she last had a mammogram. I paid for it out-of-pocket — didn’t have health insurance — and after two people had looked at it and they decided to do a sonogram, it turned out that everything was OK after all. I’m without health insurance again, but maybe I can find a way to get a mammogram free? As to BSEs, they can be something of a thrill if the hormones are just so. and, as has been suggested elsewhere, one can enroll the assistance of a partner/lover/friend! keep us posted, Ginjoint, and keep playing air guitar!! I tried to get people to chant “Up with glory holes! Down with Tory holes!” but they burst into laughter too quickly. Please would you tell me who are they? Thank you April and mlk for your good wishes. These have really cheered me up. I am quite scared, but visiting here, and reading Alison’s smart entries and the clever comments, does help. Deep breath…..BTW, mlk, you might want to give Planned Parenthood a call; they might be able to refer you to low-cost or free mammos. Why I remember my first backpacking trip in Oregon in 1973, 5 in the VW, 5 packs, and a largish dog. I was driving, so I had nothing in my lap, but the gal next to me, and the three across the back all did. Ginjoint–all good wishes to you. Take good care of yourself and don’t be shy about getting someone to accompany you to your appointments. (Choose someone you like, who’s good under pressure, whose company you don’t find draining.) A recent article (Washington post? Real Simple? My brain is overextended between workplace and homeplace obligations) emphasized that it can be hard to absorb all the information from your practitioner. Write questions ahead. Take notes during. And afterwards, you’ll have someone along for company, and cognitive, moral, and logistical support. Not trying to invalid-ize you–I’m talking about another set of hands to hold your gear while you run to the bathroom, another set of pockets to search for change for the parking meter, etc. Okay, I’ll stop gushing advice now. Ginjoint–getting my mammogram next Thurs.Thank you for the cyber “kick in the pants”, and bless, bless you dear. alison–too cute picture–is that a members only jacket? I can’t believe it has been 20 years since that ’87 March on Washington either. I was in the middle of a child custody battle. The lawyer said “Be very discreet. Don’t get your face on television.” So, it being October, after all, I wore a costume. I went as a nun with my face painted. The thing I remember the most was people waving their hands in the air with the American Sign Language gesture for “I love you.” But no one explained what it meant to me, so i thought it was the universal symbol for gay rights. (I suppose in a way, it is!) I did not find out until a couple of months later when I took a sign language course at the community college. I also remember passing some teenagers on the way down the Mall. They said “What’s going on?” I proudly told them it was a gay rights march and got a big “EWWW” back for my trouble. It was so wonderful riding the subways that week. People talked to strangers; people laughed right out loud on the Metro; such a switch from the typical DC culture of grey suits–stay in your space, don’t speak, mind your own business!! The day after everyone went home it felt like a funeral on the Metro. No more colorful birds. I swore to try and keep up my part of it, but I confess, with all that energy gone back West, it was really difficult. I met a guy on the train who was from Florida; he told me he was just in town to see his doctor. He was one of those souls you just connect with instantly. A few months later (I can’t even remember if it was during a march) there he was again on the train. Unbelievable. I have to say that my all time favorite moment in the DTWOF oevre (did I spell that right?) was when Lois, Mo, and maybe Sparrow were in the car on the way home from the Michigan Festival. They stop a McDonald’s for lunch. Somebody (probably Mo) asks Lois how she could eat a burger; wouldn’t sprouts have a better vibe? And Lois says she likes the feminine vibe of eating a COW rather than the male vibe of SPROUTS. Truly a witty moment when the philosophical and the culinary converged in a most original way. I know someone here will have the original frames at their fingertips and can correct my approximate paraphrase, but you get the gist. Awwwww…. *sniff* Thanks, all. This really helps. I’m pretty much physically on my own here, so just knowing that there’s good energy directed towards me (I’m in Chicago, just so you know which way to face!) lifts my spirits. Also knowing that some have finally scheduled their mammograms makes me feel better! Rachel, what you mentioned about making sure it’s someone who’s good under pressure, whose company I don’t find draining? Oi, have I learned that lesson in the last year or so. Thanks for the reminder that it’s O.K. to be picky about my company at a time like now. Just so you’re not all too terrified, I do have some mitigating circumstances…my biological mother had breast cancer before the age of 50, which recurred. Neither her mother (my 93-year-old grandmother, who can drink me under the table), or her three sisters have developed it, however. I’m waiting for the results of my BRCA testing to see if I have those gene markers. But again, it is SO much better to catch anything early. I can’t stress that enough. I’m shutting up now. I couldn’t figure out what to do after Ginjoint’s news followed by Alison’s Husker Du comment, so I just sat out for a few days till it was all cleared up (with aplomb, natch). Ginjoint, what a rough hand you’ve been dealt, honey! We’re all pulling for you. Many thanks to the DTWOF blogger who posted the link to Barbara Eihrenreich’s excellent piece on breast cancer a few episodes ago. It appeared in Harpers in Nov. 2001 and is really just a fabulous piece. Got me to thinking about mammograms and such, as well. Ginjoint, if you haven’t read it, I’d recommend it (although it might also NOT be along the lines of what you’ve been feeling lately). Does anybody remember the band from BETTY and Casselberry & Dupree singing at the MOW in Oct. 1987? I LOVED those women!!!! I remember piling into a coupla station wagons from a Boston campus, driving all night to DC, sleeping for about 3-4 hours, “marching” all day, and then driving the whole night back to Boston. We were SO FULL of ENERGY. Just holding hands with another woman on the mall (who cares we didn’t know each other?) was SO liberating!!! Ah, and the crushes, the crushes…. Sigh! Thanks Silvio, for refusing to call it Reagan airport. I’m with ya! And to Ginjoint, for sharing her humor and anguish with all of us during this rough time. Damn, ready2agitate, thank you! Man, (oops) coming here makes me feel so much better. And…you’re welcome for the link to the Barbara Ehrenreich article. ::grin:: That was me who posted that. I love Ehrenreich and share her feelings on the Cult of the Pink (ooo, good band name!). She was the first writer, let alone first woman, I found who dared to say what I was thinking, only so much more humorously and eloquently. BJ, I too have had trouble finding kindred spirits, but in my case, it’s been my own damn fault. I’m shy and kind of a loner, which doesn’t help me when I do need some social contact. I hope you find a tribe soon…. Gah! I wrote the word “grin”, and look what it did! Stop transforming my words for me!! Haha 😀 yes please take someone with you Ginjoint. My wifey always gets me to accompany her to medical stuff, and as much as it seems silly and joined-at-the-hip going in together, it’s always worth it at “remembering stuff” time. Stay well. When I was in high school, we had “school spirit” days where we were asked to support the school’s sports teams by wearing the school colors, which were blue and white. Those were the days I did not wear jeans. Ginjoint, please do get a second opinion, even a third opinion. I hate to sound callous, but it’s from experience: doctors get paid more for using knives and this can affect their choices. I once had a problem with my knee and it was clear the doctor just wanted to rubber stamp the other’s opinion (different practice, same hospital). I had managed to get the MRI report and had deciphered it by searches online. I told him the MRI report disagreed with the first opinion. He read it, finally looked at my MRIs and and took me on. He solved my problem with exercise and physical therapy where the first one had wanted surgery (two in fact). That suggests it’s best to try a second opinion with a doctor who is not affiliated with the same hospital as your current one. They use the same operating rooms and run into each other in the hospital, so taking a patient away from a colleague creates bad atmospheres. Yes, mastectomies will remove the potential problems, but surgery is always risky (i.e. anesthetic problems during, or adhesions years later). D’oh! Missed Nat’l Coming Out Day AGAIN?! What a pity- my CPA office work has been nose to grindstone since Monday is the extended 1040 deadline and I missed it… Well, better late than never: I’m STRAIGHT!!! W00T! Thank you, Suzanne. I’m having a consultation with my internist today (who has also been through breast cancer), who’s not at the hospital of my surgeon or oncologist, although she used to be. I feel like I’m in a time crunch, which I’m going to bring up with her. The world is spinning so fast…thanks again for your good wishes. Ginjoint–Please add my well wishes to the list! I’m tellin’ ya, if I lived in Chicago, I’d be offering to bring over lasagna or whatevah you needed. I hope it all goes well. On the topic of marches, I am fer sure going to be at the RNC when those people are in St. Paul next summer. And not as a participant in the Excel Center! Here’s my protest story from way back: It’s 1985, I’m taking a Black feminist writer’s class with the marvelous Barbara Smith at the U of MN. There’s a protest/rally against ROTC prescence on campus, which I attended. The cops ended up macing a bunch of people and Ms. Smith was there, just really shocked. I wasn’t, because sadly the Mpls. police just had a horrible reputation (well-earned) in dealing with protesters throughout the 80’s. The odd thing was, the police chief’s wife would often be handing out donuts to the protestors at various marches….or that’s what my dim memory tells me…. And going for the longest I have ever posted, in an ironic twist, the then-chief-of-police, Tony Bouza, is currently testifying *for the complainant* in a police brutality case in a nearby suburb. Huh. Thank you, judybusy. I’m wolfing down a sandwich, on my way to my doctor…nothin’ says lovin’ like pasta. I came on to comment on the previous strip, so I’m sorry to get off the topic, but it’s bugging me: I haven’t seen Raffi address Clarice for a long time. Toni is “your Mom”, now. They used to be Mommy and Meema. But what does he now call his adoptive non biological coparent/mother? It seems very important, somehow, now that mommy and meema are on los rockos. i enjoy the drawing style, the cowboys and the women who look like men. It’s very enjoyable for us teenage fans of DTWOF to read the early strips from the 80’s, and compare the characterstyles to the ones now! You look great on the photo by the way, Allison. Duncan–please try to understand what people mean rather than picking on their literal words. Yes, the cowboys have come in “all the way from Iowa.” This does not mean that both, or either of them, are originally “from” Iowa. They could be transplanted Texans. They could be transplanted Okies. And, no, not everyone who says “Howdy” and wears cowboy gear is a Village People reject. It’s not a sentiment you would want to share with people in Poteau, anyway. True story .. Pravda ..March on Washington .. Last day someone(s) left a red teddy on J. Edgar Hoover’s grave .. FBI quickly recovered it … few months later old Hoover era FBI Big Boss in Anytown USA is retireing. ….. Lunchon and roast in progress …. guy comes up on stage in a full face Hoover mask and trench coat .. begins yelling at Big Boss for letting the Bureau get so liberal. .. when he gets to the part .. “And now we even have GAY agents”, he takes off the trench coat and is wearing THE teddy (and nothing else) … Pandemonium brakes out .. local police chief’s wife screams …. Retired Hoover era agent yells “Blasphemy!” and has to be physically restrained. … I was asked … “Do you know any human rights lawyers who would defend a very straight FBI agent who was being fired for honoring a great gay American? … fortunately one wasn’t needed. ….. The video tape is still out there somewhere .. Pravda! A little more comment on the cowboy attire on those Iowans–I think it totally fits and isn’t a costume. The attire is sometimes worn by rural folk in the midwest. My dad has worn cowboy boots as long as I can remember and his dress wear was a dark brown polyester Western cut suit. He wore it, the boots and his good cowboy hat to my ceremony when I graduated from the U of WI, Madison. So, it’s just part of rural American farming culture, which, sorry to say, doesn’t sound like many here have seen a lot of! Happy to provide the context! I have no idea what is going on in these comics, and where is the punch lines? I think that this comic is funny, Hey guilty conscience. I think there’s a punchline in every frame. p.s. i’m talking about the present clarice. the one above… maybe you’re right on that one, AB. In my usual overscheduled a day late and a dollar short fashion, I posted a big reply on the most recent new cartoon ( Mo and Sydney in the apple orchid, Toni and Clarice with the leaf pile ) and since I posted so late I dont think anyone is seeing it–I am in school full time struggling with a disability; I tend to check things when I can with huge gaps of time sacrificed to homework and dr.’s visits )So anyway, anyone who would like to double back and look and have fun with feedback, go take a look at the post…it’s still currently the last post in the lineup. I would say given that there is a huge progay religious political innitiative rocking my very conservative home town right now, that mass protests and grass roots innitiatives are alive and well and kicking, thankyou very much!!! The pink and the black triangle were used by the Nazis to mark people in the concentration camps. Gay men had the pink triangle – thats more or less commom knowledge, or isn’t it? – but lesbians were being made invisible while being punished for being lesbian, because the black triangle they got to wear meant “antisocial” and not everyone with a black triangle was a lesbian, could be anyone who didn’t fit in. Though I know that reclaiming things used to degrade us is important, it still kind of give’s me the creeps to see people wear it (or have it on their toilet seat covers). Shouting (chanting to my mind does not describe the sound) in a demonstration felt wired – and the onlookers mostly never got the text anyway.